Our private house in sunny Heidiland has 4 rooms and is on the sunny side near the Heidi Museum. The family-friendly house offers a living comfort with the classification of three stars. Suitable for 2 - 6 persons. 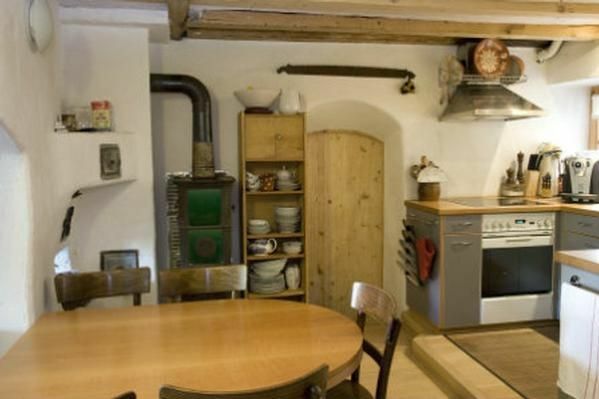 Is a Walserhaus from 1710, but was lovingly renovated. It leaves nothing to be desired. From the house, as well as from the front seat lying out gaze wandering into the wine region of the Bündner Herrschaft. It offers relaxation and is also the place of all sorts of opportunities to actively shape the holidays. Activities: Skiing in the famous village of Klosters or hiking in the mountains at Piz Zoll. Bathing in the spa Bad Ragaz or in the blue Walensee. Easy walks along the vineyards with their inns. Tennis, golf, horse riding or cycling along the Rhine. Culinary the Bündner Herrschaft is top class. In wine, winemakers are among the best. Bed linen: once per person for rent at a price of 10 CHF (Mandatory). Cot for children: per object and day for rent at a price of 5 CHF (optional). Heating: per object and week Costs amounting to 57.84 EUR (Mandatory). Towels: per person and week for rent at a price of 2 CHF (Mandatory). Pet: per pet and day Costs amounting to 5 CHF (Mandatory). Rofels is a hamlet and is about 20 min. on foot above the town of Maienfeld. Maienfeld has a rail connection and can be reached from Zurich within 60 minutes.